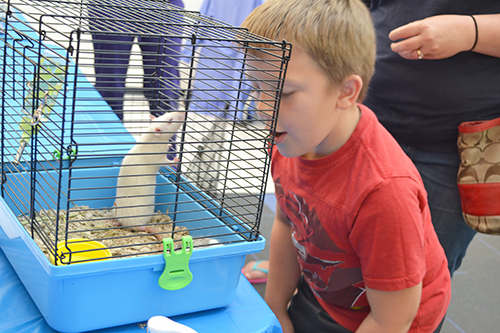 A young visitor gets to get up close and personal with a rat at the Vet Med Open House. Animal lovers of all ages flocked to the College of Veterinary Medicine on Sunday, October 7, to experience the biggest and best petting zoo around…the annual Vet Med Open House. 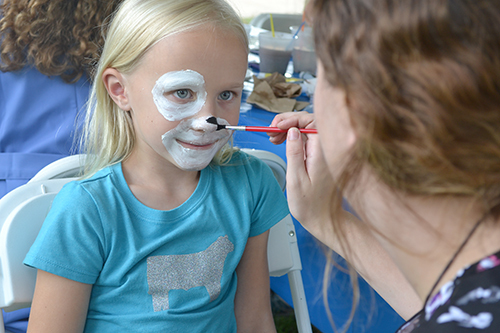 The event featured myriads of activities ranging from seeing and touching animals, to learning how to care for them, to getting one’s favorite animal painted on one’s face. Most exhibits were staffed by VetMed students who were proud to share with the visitors what goes on in the College, what it’s like to be a student at Illinois, and some of what they’ve been learning as they study to become veterinarians. For the numerous youngsters who showed up with parents in tow, the students hoped to not only inform them and give them a good time, but possibly recruit some future veterinarians into the field. 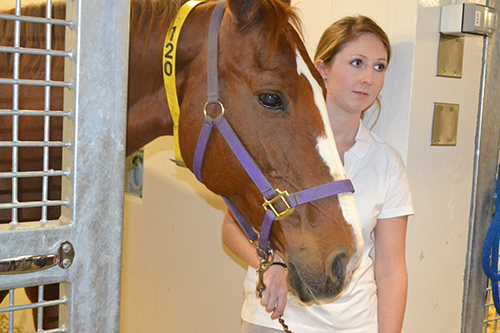 First-year veterinary student Rachel McQuay, who hopes to specialize in equine veterinary medicine, gives visitors a chance to pet a horse. Visitors got to interact with species ranging from as tiny as a mouse, to as big as a horse. Plus, touching, petting, or even holding animals was the order of the day, whether covered with scales, like Ciara the red-tailed boa constrictor; fur, like Kahn the border collie; or feathers, like the exotic birds from the Wings of Wonder Avian Rescue in Mahomet—a perennial Open House favorite. 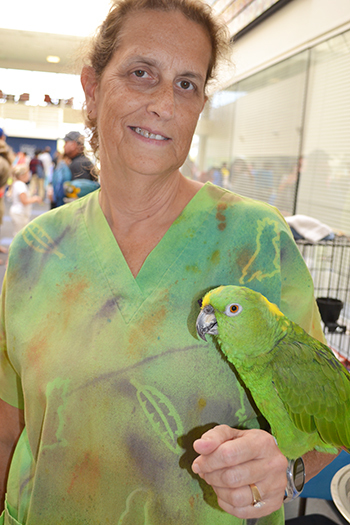 Laura Peyston holds Cracker Jack the parrot. Another responsibility potential owners should consider is that these birds require specialized veterinarians. While they get fewer diseases than other animals, the vet costs are higher. 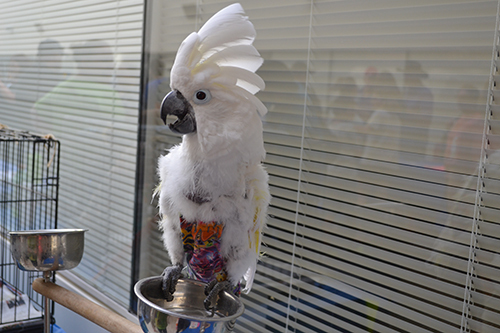 In fact, because their birds require veterinarians with special veterinary skills, the rescue usually brings them to Illinois’ College of Veterinary Medicine. Plus, in another win-win for both organizations, the rescue also brings their birds to Vet Med a couple of different times throughout the year to help train students, giving them “a chance to handle them, draw blood, do physical exams with them. It gives them the chance to handle them so they have a better idea at what they're doing,” she explains. A young visitor gets her face pained at the Vet Med Open House. Currently doing research at Professor Matt Allender’s Wildlife Epidemiology Lab, his work involves diseases among snakes and turtles. Winter hopes for a career in zoo medicine or wildlife research once he graduates. Bennett Lamczyk with Kahn the border collie. 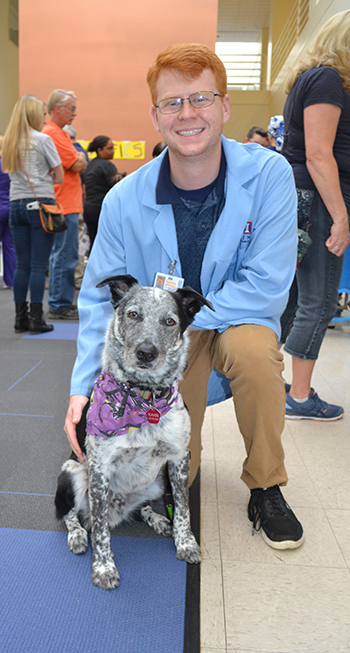 Second year VetMed student Bennett Lamczyk, who was at the event to introduce visitors to his canine friend, Kahn the border collie, says he participated in the Open House because it's a really great way to interact with the public. “I'm here to teach people about how to properly approach a dog and hopefully teach the public how to safely interact with animals, which is really part of the veterinary mission,” he explains. 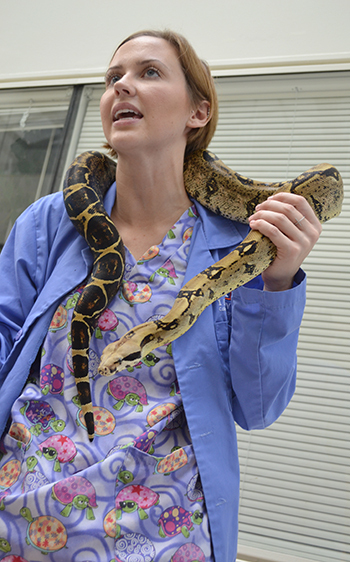 Third year Vet Med student Megan Gramhofer holding Ciara the red-tailed boa constrictor. 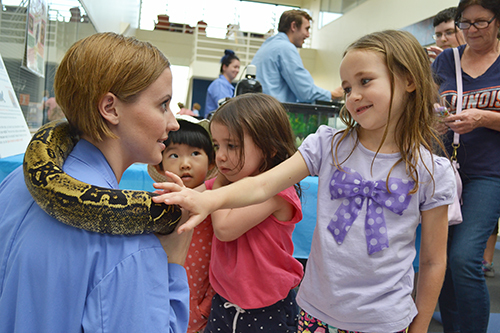 Third year Vet Med student Megan Gramhofer was on hand to communicate with the public regarding a species she’s particularly passionate about…snakes. As part of her show and tell, she brought a friend, Ciara the Snake, a red-tailed boa constrictor, for the more intrepid to touch or even pet. She became really interested in snakes during her freshman summer of undergrad, when she got to do research with the snakes on her school property. “I had always loved other reptiles and amphibians, but snakes—not so much,” she admits. “Through working with them, I got to appreciate how cool and important they were.” That opportunity has fueled her love of snakes, and she’s currently researching snake fungal disease as a member of the Wildlife Epidemiology Lab. Regarding most folks' (including this reporter's) fear of snakes, she acknowledges that, “It's hard not to be scared of snakes when our culture portrays them in such scary way with movies.” Her advice to help folks deal with their fears is to find out more about them. “I think my biggest pointer is to ask questions,” she advises. “If you know someone who has a pet snake, ask them about it. There are books on why snakes are important to the environment. Education is the most powerful tool. 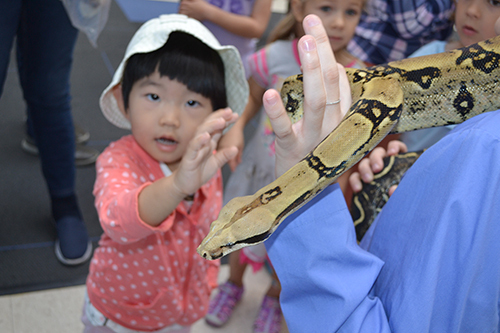 Above: A young visitor gets to touch Ciara the red-tailed boa constrictor. Below: Megan Gramhofer interacts with young visitors at the Open House. As a snake researcher, she gets excited when people ask her questions about why she loves them. “It gives me an opportunity to tell people the positive impact snakes have on the environment.” For example, snakes keep rodent problems at bay because rodents are their main food source, which in turn also helps keep the tick population smaller, because the ticks live on the rodents that the snakes eat. Gramhofer’s dream job is to work in a practice with large animals, small animals, as well as exotic species (she had to include snakes, of course). Third year Vet Med student, Chelsea Ciambrone, Vice President of Illinois Chapter of the Wildlife Disease Association and the Class of 2020 Aquatics Chair, reports that she enjoys participating in the Open House because it provides her the opportunity to share about the species she works with and how important veterinary medicine can be. 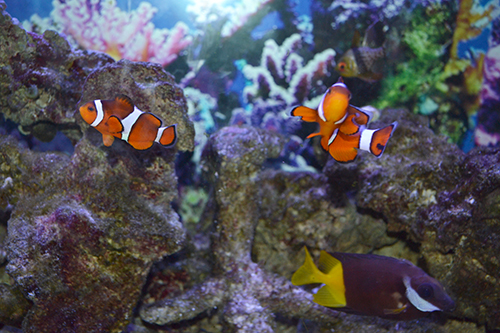 Every aquarium, including the one on the second floor of the VET Med Basic Sciences Building, should have some clownfish—a nod to Nemo and his dad! Ciambrone’s dream job is to be an aquatic veterinarian at any aquarium—small or large—that participates in whale and/or shark conservation efforts and research. The scores of visitors who dropped by the Open House came to find out more about animals, personally interact with them, and to expose their kids to them too. For instance, one local woman, Libby Kacich, brought her two daughters to the open house because they both love animals. In fact, her five-year-old, Caroline, actually wants to be a veterinarian when she grows up. “So she was really excited to come here and see all the animals and see where the students learn how to become veterinarians,” her mom explains. Both Caroline and her little sister, three-year-old Birdie, who also adores animals, have been begging mom for a cat in addition to their dog. In fact, Kacich says that on the way to the open house, Caroline insisted, “Mommy, I think that they let you buy some of the animals," to which mom, of course, gave the classic parental response, "We'll see." 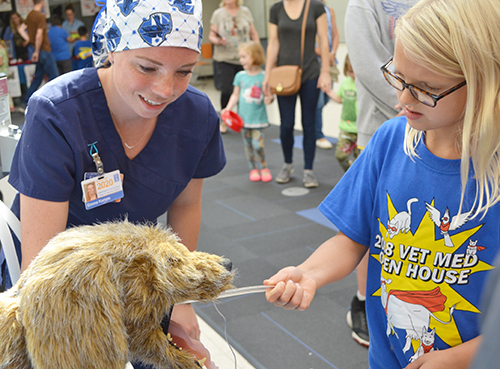 Third year Vet Med student Emma Kamps instructs a young visitor to the model they use at the Veterinary Teaching Hospital to practice intubating patients for anesthesia. In this photo, the local 3rd grader is extubating the patient (removing the tube). 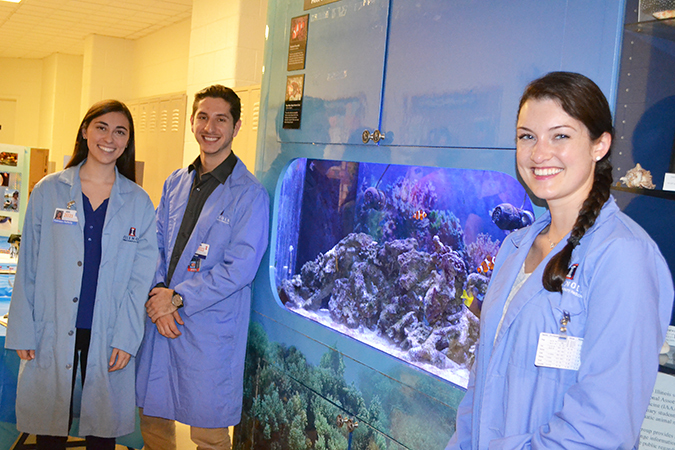 Kathleen Rafferty, Alec Colosi, and Chelsea Ciambrone, who are particularly intrigued by aquatic animals, exhibit the aquatic animals, including the clownfish, in the aquarium on the second floor of Vet Med's Basic Sciences Building.